We all know that NLL players frequently have other jobs outside of being a lacrosse player. A number of them are teachers or firefighters. Former Toronto Rock players Dan Ladouceur and Bob Watson are police officers. There are white-collar and blue-collar workers. There are university and college students. And there are entrepreneurs who run their own businesses. But some of the players external jobs are a little more unusual. For example, everyone knows that legendary Bandits forward and captain John Tavares is also the captain of the the New York Islanders in the NHL. Here are a few others you may not have known about. Buffalo’s Shawn Williams is also a safety on the Cincinnati Bengals. Rock captain Colin Doyle is not only a part-time lacrosse goaltender but also a full-time soccer goaltender in Ireland. 2012’s Rookie of the Year Adam Jones is a very busy guy. Not only does he play with Shawn Williams on the Bengals as both a cornerback and a video game character, but he also plays center field with the Baltimore Orioles in the summer, and in whatever spare time he has left, he’s the guitar player for the band Tool. Jones is not the only part-time musician in the NLL; Buffalo’s Anthony Cosmo is the former rhythm guitar player of the band Boston, Bob Snider is a folk musician, and both Shawn Evans and John Grant are singer-songwriters. Both Snider and Grant look older with beards. 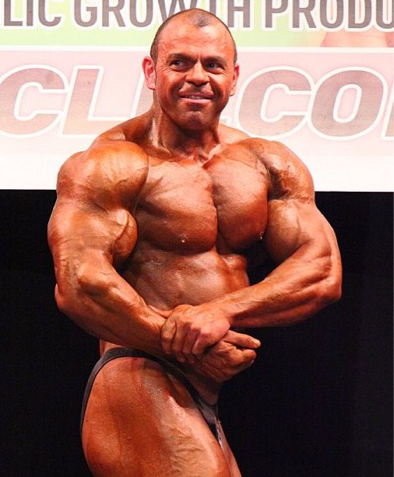 Calgary’s Andrew McBride does a little bodybuilding on the side. See his picture on the right. Hair makes a big difference in his case as well – he looks quite different with the short hair and without the ‘stache. Edmonton forward Mark Matthews is a glass artist while teammate Jeremy Thompson is a former football player, having played for the Green Bay Packers back in 2008. Toronto goalies Nick Rose and Brandon Miller are also both former football players. In 2013, Rose was a kicker for the University of Texas Longhorns, while Miller is a defensive end who’s played for the Falcons and Seahawks. Paul Dawson has a Ph.D. in food science and when not protecting the Knighthawks from opposing forwards, he’s either teaching food and nutrition at Clemson University or producing hip hop artists under the name “Hollywood Hot Sauce“. The most famous aside from Adam Jones is likely Vancouver forward Cliff Smith, who made a name for himself as rapper and producer Method Man before chucking it all for the relative obscurity of pro lacrosse. And the oddest of them all: When Rochester’s Jordan Hall isn’t playing lacrosse, he transforms into a building, spending his time hosting concerts in Boston. Some controversy has erupted after game 5 of the Mann Cup. If you haven’t heard about it, Victoria Shamrocks goaltender Matt Flindell started games 1 through 4 but after getting hit partway through game 4 and missing the rest of the game, he did not play in game 5. There have been suggestions (I’ve seen them on Twitter, Facebook, and the IL Indoor message board) that Flindell is not as injured as he says he is and that he has therefore bailed on his team. The alleged reasons for this are varied – one person said he “couldn’t stand the heat” while another said that he “didn’t want to play bad and ruin his NLL stock”. I don’t know Matt Flindell and I haven’t talked to anyone on the Shamrocks so these rumours are all I have to go by. But I find either of these ideas a little hard to swallow for a few reasons. First of all, he got hit pretty hard in game 4. I was sitting right behind the net and saw him go down. He was down on the floor for a couple of minutes, at the same time his teammate Tyler Burton was also down. Burton was helped off the floor while Flindell eventually walked off on his own, but neither player returned to the game. One newspaper report said he got hit in the head, though I thought it was in the chest. Another report simply said he was “bowled over”. Here’s a picture from twitter (credit: Jules) showing both Flindell and Burton on the floor. Burton missed the rest of the game. Nobody complained. Jon Harnett missed games 3 and 4. Nobody complained. Dhane Smith missed game 2. Nobody complained. Then Flindell misses game 5 after possibly getting hit in the head and he’s a selfish quitter? At the World (Field) Lacrosse Championships in Denver this past summer, John Grant was not allowed to take the medication he’s been taking since his life-threatening illness in 2009. He decided to sit the tournament out rather than risk his health by not taking the meds. Nobody called him a quitter or said he was bailing on his country. Everyone was all “health is more important” and they were right. Is that not true anymore? Have we learned nothing from head injuries in hockey and football as well as lacrosse over the last decade? If an athlete may potentially have a concussion, shouldn’t he be encouraged to sit out rather than ridiculed for it? Couldn’t he have pulled himself from the lineup because he feels his injury means that he can’t play at his best? Perhaps he decided that the team has a better chance of winning with Cody Hadegorn at 100% than Flindell at 80%. Sounds like a team player to me. Secondly, Flindell is an athlete playing at the highest level of his sport. He’s 27 years old and has likely been playing lacrosse for 20+ years, including 6 in the WLA. You don’t get to be the starting goalie on a Mann Cup team without playing through injuries once or twice. He’s also a goaltender and we all know that they play under pressure all the time. In a baseball game, when it’s tied in the bottom of the ninth and the game is on the line, there are some players who want the ball to be hit to them – they want the pressure because they thrive under pressure. They have the confidence that they will make the play. Others think “Don’t hit it to me! I don’t want to screw it up!” People who have the personality that would put them in this second group do not generally become goaltenders and they certainly don’t make it to the highest level of their sport. So how likely is it that Flindell plays 6 seasons in the WLA and finally gets to the Mann Cup, plays 3½ games (winning two of them), and then folds under the pressure? And thirdly, not playing won’t help him gain favour with the NLL GM’s. Not playing because he’s injured won’t help either, and it might hurt him a little. And if he’s not injured but says he is, he’s got to know that it’ll get out and then he’s got no chance of ever seeing action in the NLL again. But you know what would help his chances? Playing as much as he possibly can in the Mann Cup, even if his team loses. So why would he voluntarily give that up? Conclusion: The only reason for Flindell to be faking an injury would be to get out of playing in the tournament he’s been dreaming of playing in for his entire lacrosse career. It’s unlikely that a 27-year-old goalie with 6 years of experience in the WLA would fold under pressure of playing in the Mann Cup, particularly halfway through the tournament when he’s been playing well. Nobody knows the real extent of his injury except him and his doctors. Nobody knows what kind of pain he’s feeling except him. Given the number of careers that have been cut short by concussions, tempting fate by continuing to play when you may have one is dangerous. Now, I could be way off here. I’m freely admitting the possibility that I’m dead wrong. It’s true that some of the people who have been talking about this situation know the Shamrocks players, while I do not. In particular, Teddy Jenner (a former Shamrock himself) knows everyone in lacrosse, and he’s not likely to throw a player under the bus if it’s not deserved. It’s also true that I have not seen any tweets or other public comments from Shamrocks players defending Flindell. Maybe it’s the critical thinker in me who doesn’t believe stuff just because someone said it – I want proof, or at least evidence, none of which seems to be available. But if the only source for actual evidence would be the Shamrocks, it’s likely that even if they’re angry, nobody will be calling Flindell out publicly. So perhaps evidence is simply not forthcoming. But until I see it, I’m giving Flindell the benefit of the doubt, and I wish him a speedy recovery.